Riding the crest of the hill like a great ship, St Andrew is the largest of the churches in the marshes between Norwich and Yarmouth. 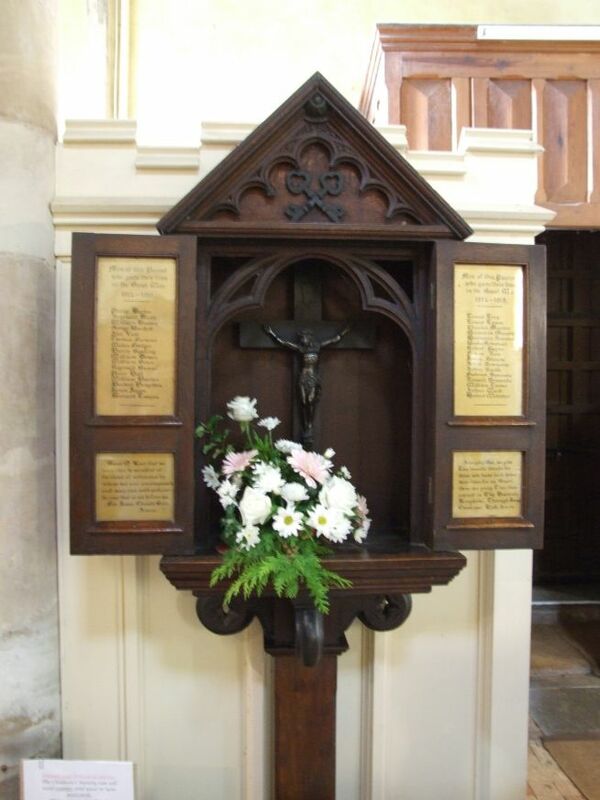 The parishes around here are tiny, and 'packed like squares of wheat', but Blofield and its neighbour Brundall form a kind of metroland to Norwich, middle-class outer suburbs connected to the city by train, and full of lovely early 20th century villas. 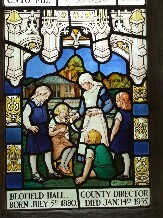 The name of the railway station is Brundall Gardens, which sounds as if it has stepped out of the stanzas of a John Betjeman poem. 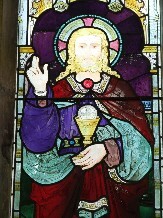 The setting of St Andrew is far from suburban, being the church lane on the edge of the old village, with some pretty houses for company. 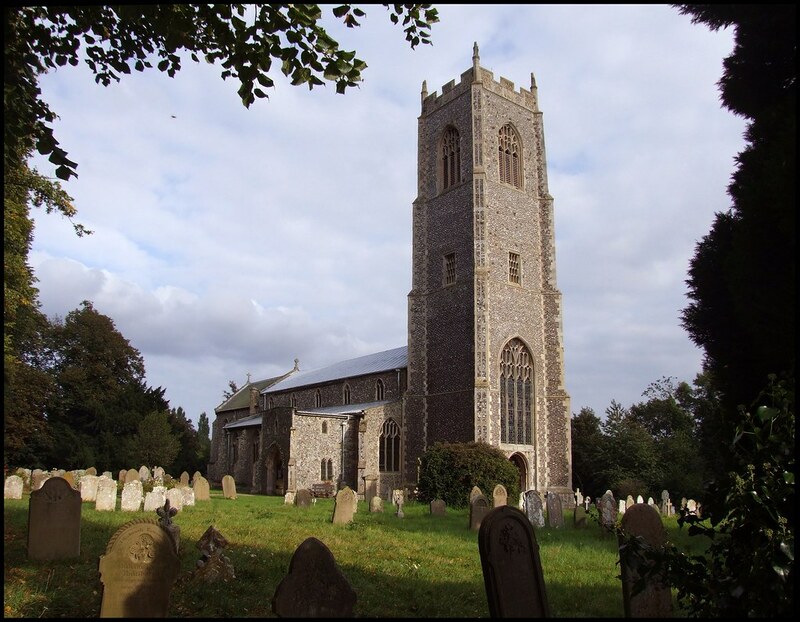 The great tower, one of the tallest in Norfolk, matches the wide aisled and clerestoried nave perfectly, and they were all built together in the early part of the 15th century, according to will evidence. 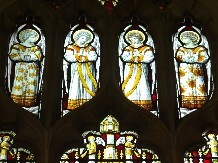 They look slightly older, but in any case the window traceries are all modern replacements. 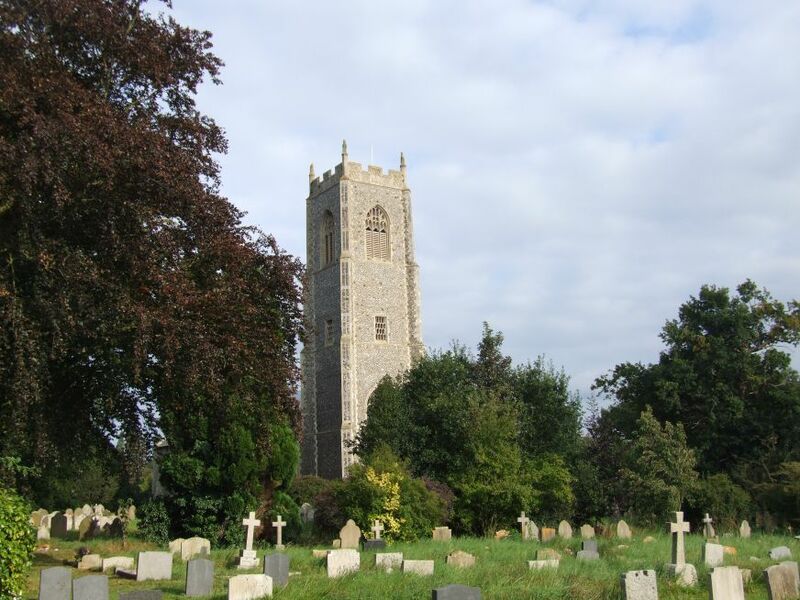 The graveyard stretches wide around the church, as if all south-east Norfolk comes here to be buried. 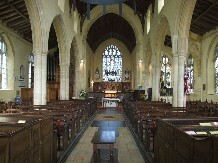 We came here towards the end of the day of the Norfolk Historic Churches bike ride 2007. 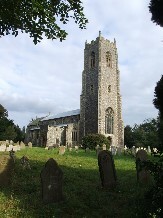 We had seen this great tower all afternoon from a distance, and as we approached the church unfolded itself beyond it. 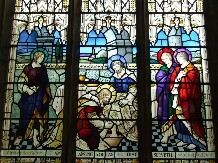 The windows give a clue of the extent of the Victorianisation, and once you get inside the first impression is of a fairly anonymous, urban church of the period. 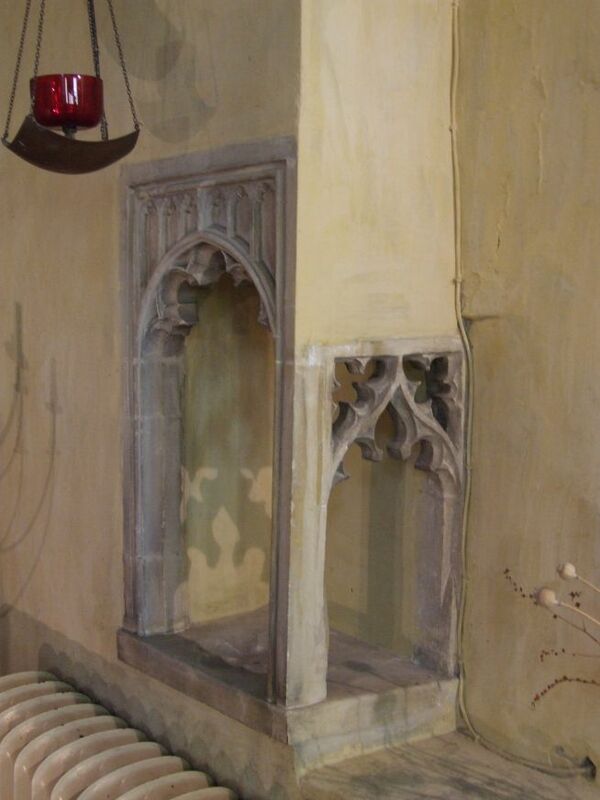 And yet, the building contains features of great interest, almost entirely from centuries before and since. 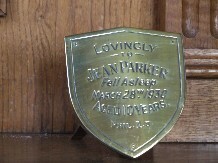 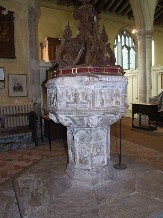 The outstanding feature of the church is the font. 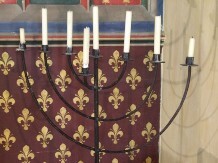 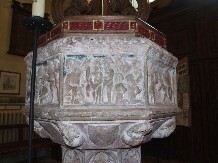 The design is unique in East Anglia in my experience. 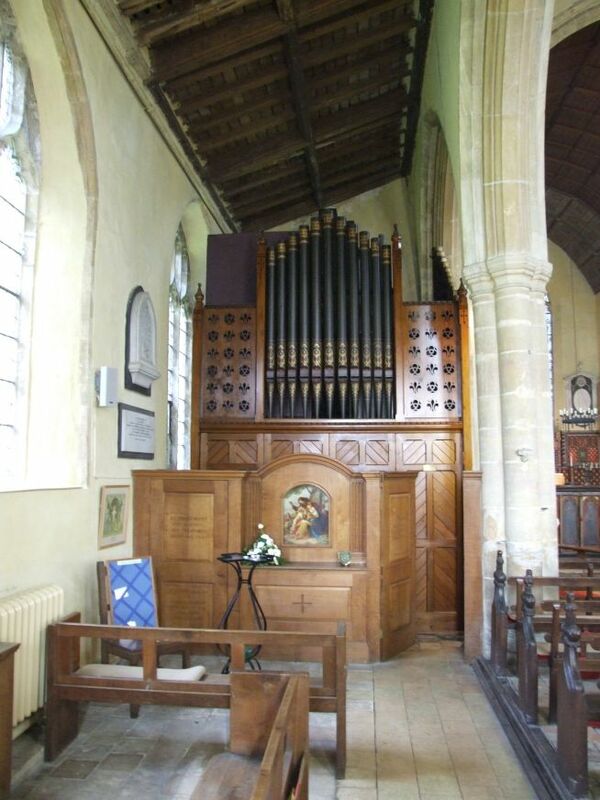 Cautley thought it was 14th century, while Pevsner went for the 15th, but I wondered if a number of flowery features on it might point to a date in the first few decades of the 16th century, when the inkling of an English renaissance was being felt. 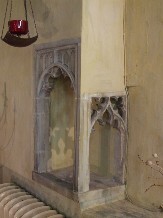 The Reformation would kill it dead as far as churches were concerned, but for a time there was a beginning of a flowering in styles beyond the Gothic, even in English churches. The panels depict a rosary sequence, a series of images from the life of Christ intended for contemplation, perhaps while 'telling bedes'. 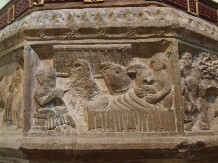 The first is the Nativity, with a rather alarming donkey braying to announce the birth. 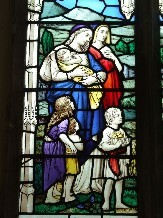 Next, the Flight into Egypt, with Joseph on foot carrying a bundle on a stick, while Mary rides on the donkey with the baby. 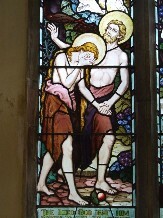 There are then scenes from the Sorrowful Mysteries: Christ arraigned before Pilate, the two robbers on their knees behind him. 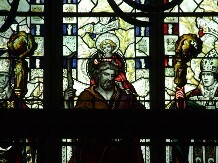 We see Christ scourged, and then Crucified. 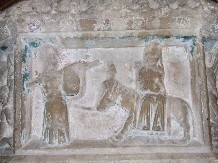 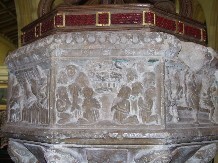 A dramatic Resurrection scene shows him stepping from the coffin, while the Roman guards sleep. 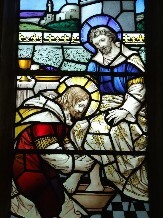 Finally, the Ascension of Christ into heaven, which follows the medieval convention of having the disciples gathered on their knees on both sides looking up to see Christ's feet disappearing into a cloud. 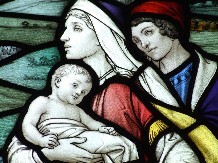 Rosary sequences of contemplative scenes are more usually found in wall paintings and glass, but are not completely unknown on fonts. 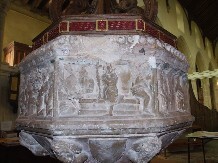 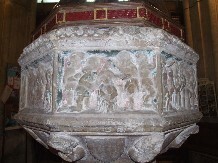 Elsewhere in East Anglia there is a sequence of Joyful and Glorious Mysteries on the font at Ipswich St Matthew. 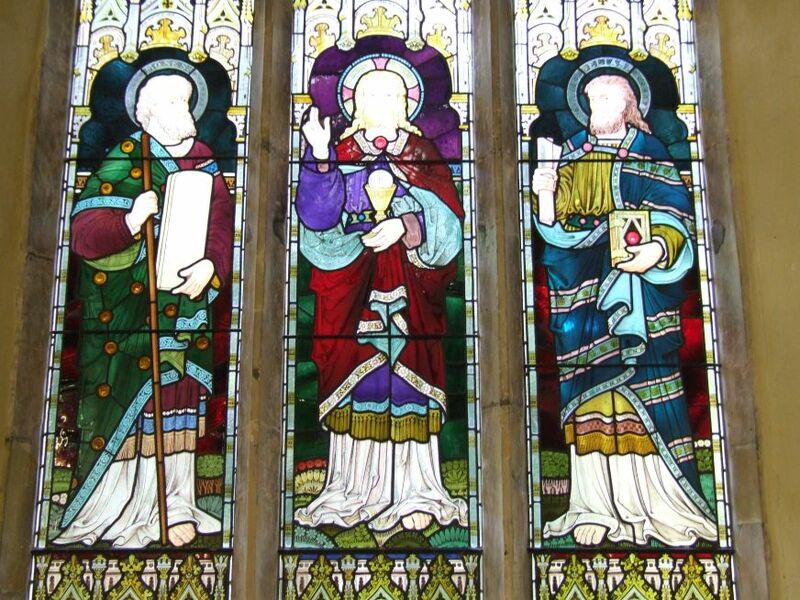 If the font is the most historically significant feature of Blofield church, the most striking is certainly the sequence of late 19th and 20th century windows. 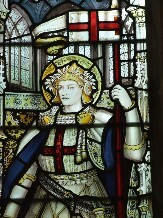 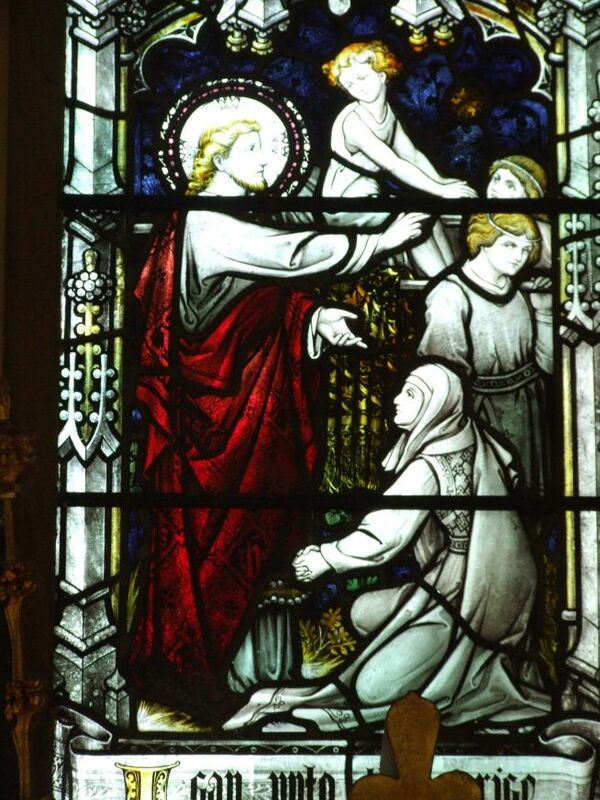 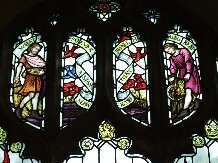 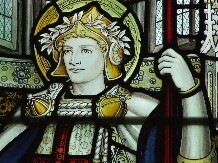 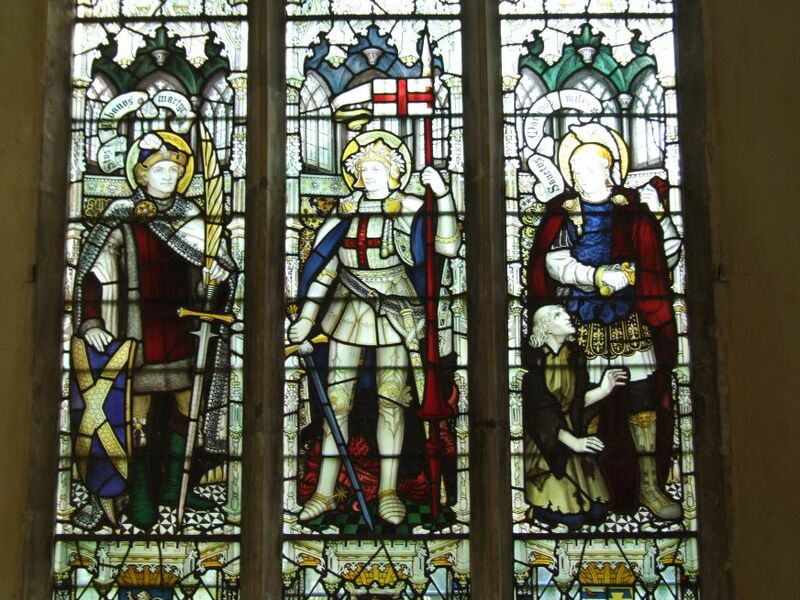 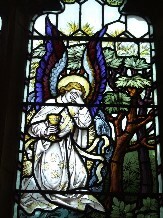 The best, and most famous of these, are the two Harker memorial windows of 1936 by Reginald Bell in the south aisle. 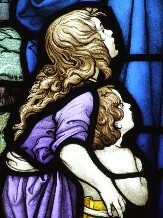 Even at the time they were thought splendid, and there was a feature about them in the Illustrated London News. 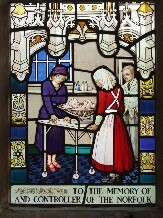 They remember Margaret Gordon Harker, of Blofield Hall, County Director and Controller of the Norfolk Branch, British Red Cross Society. 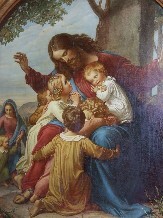 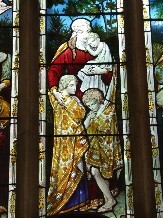 The main lights are filled with two stunning Biblical scenes, one depicting Christ washing the feet of Peter, and the other of Christ bidding the little children to come to him. 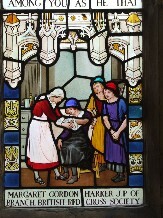 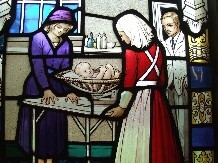 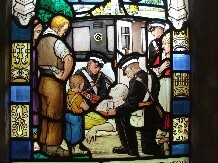 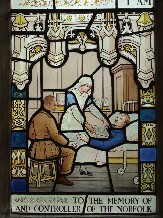 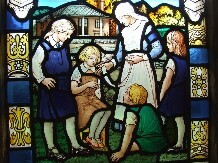 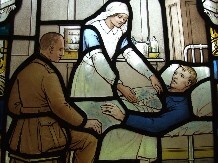 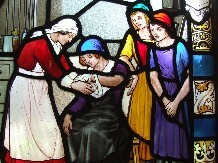 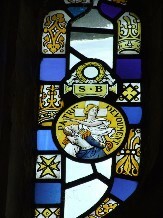 These themes of service resonate further in the six lower lights, where there are scenes of a war nurse, a school nurse, St John's Ambulance men, a midwife and a Red Cross nurse. 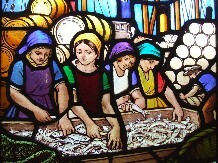 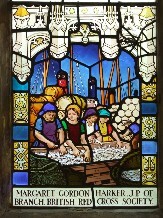 Best of all, perhaps, is the charming depiction of Scottish herring girls gutting fish at Yarmouth. 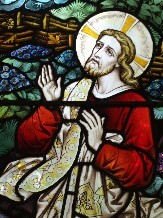 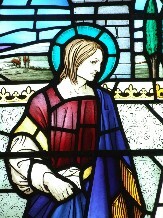 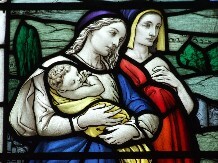 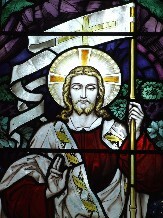 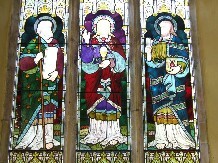 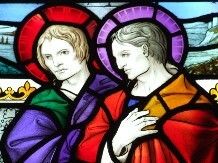 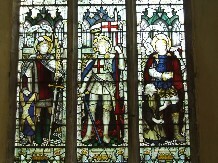 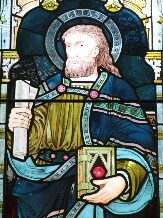 Taken together, the two windows form what is probably the best work of its decade in any East Anglian church. 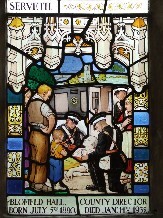 Click on the small images below to view them large. 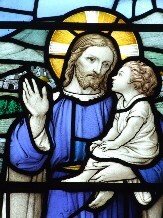 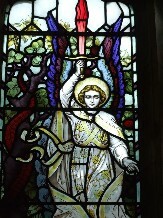 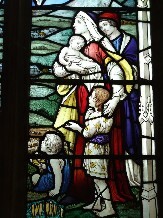 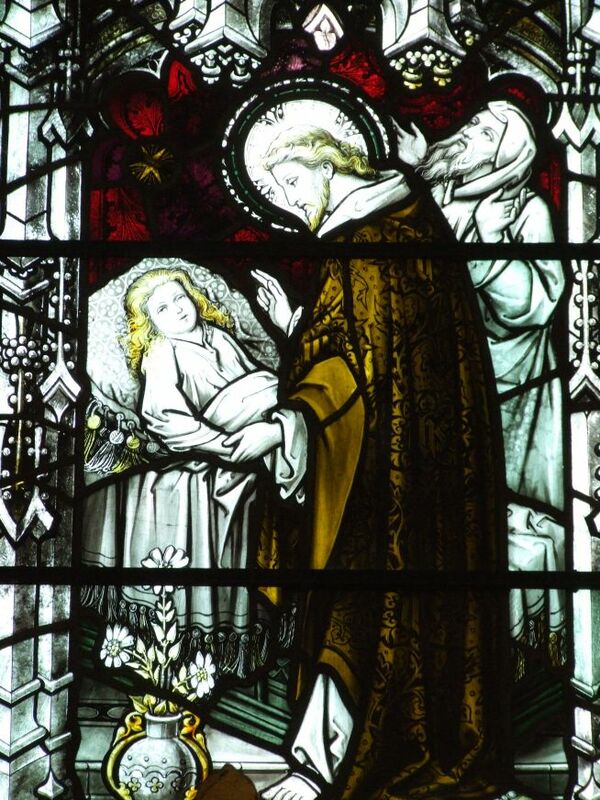 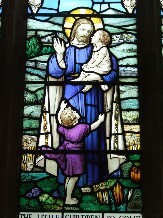 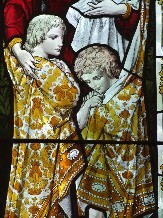 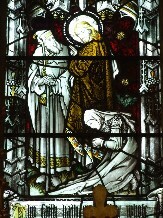 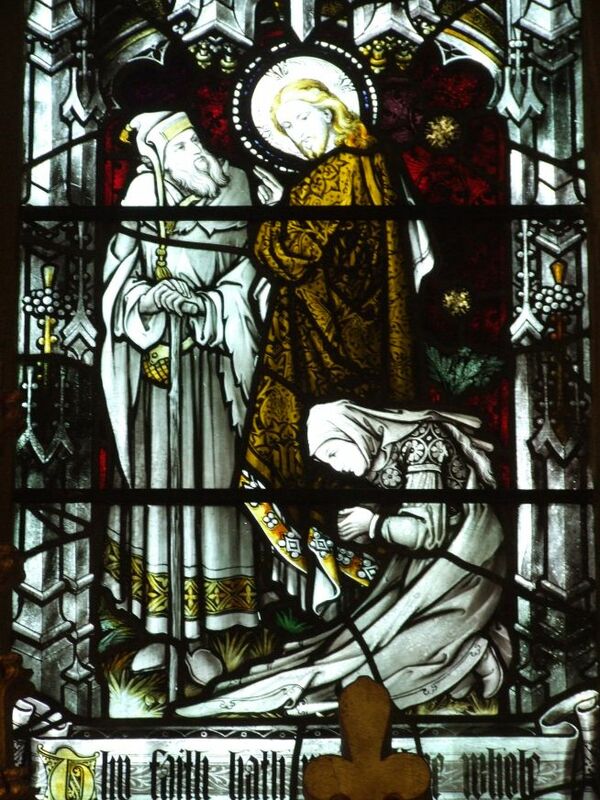 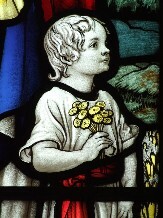 Much of the other glass is by Hardman & Co, but there is also an excellent window depicting one of the Works of Mercy by J & J King of Norwich. 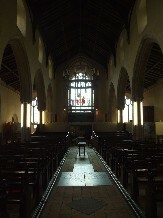 They illuminate and beautify what might otherwise be rather a dour nave, although even here there are some features of interest. 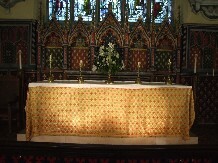 The box pews at the west end are banked up, probably for use by schoolchildren. 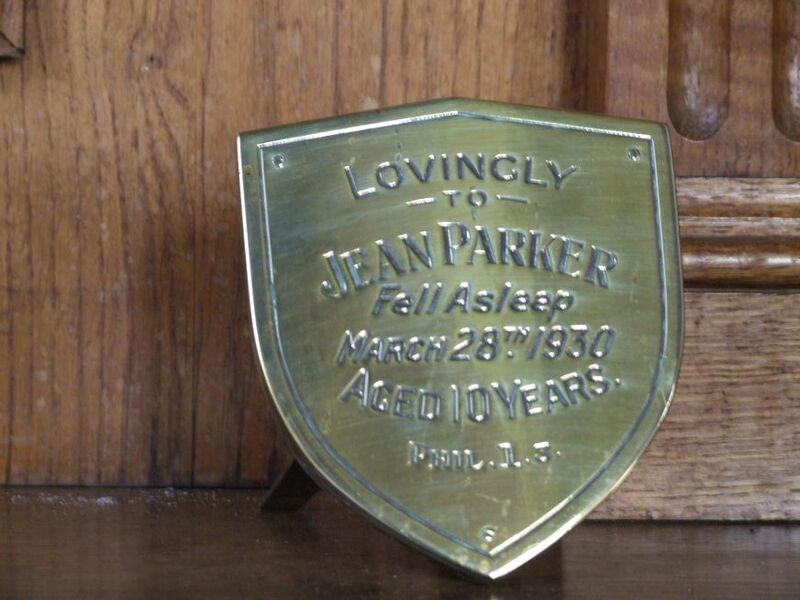 18th and 19th century banked seats may be seen in a number of East Anglian churches, but these were the first boxed ones that I had come across. 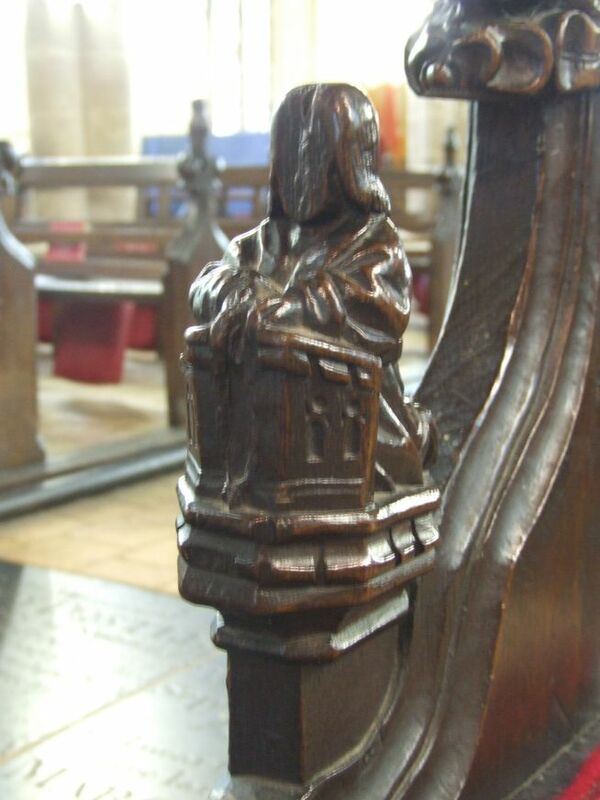 The medieval pews nearer the chancel are lovely, although a little ill-fitting. 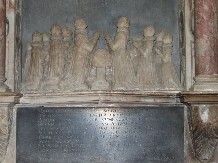 I think they must have been brought here from the ruined church at Burlingham St Peter. 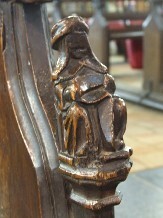 One of the carved figures is holding a rosary, and you can imagine him contemplating the font. 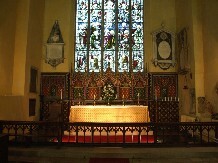 If the nave is saved from drabness by the windows, the chancel needs no help, for it is magnificent all by itself. 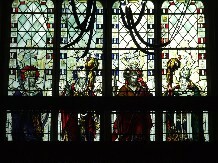 It is in the full flourish of triumphalist early 20th century Anglicanism, decked out for mysterious, ritualist, incense-led worship. 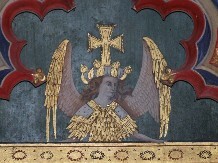 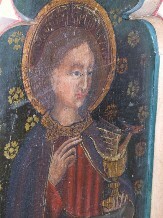 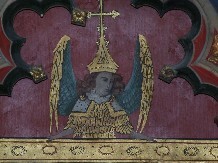 The angels painted on the reredos are based on those on the famous screen at Ranworth - I would hesitate to call them copies. 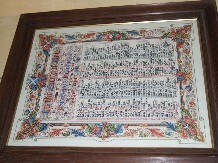 The dado of a 15th century screen separates nave and chancel. 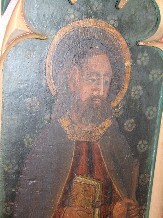 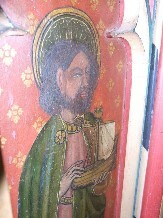 The figures of the Apostles are repainted, but are not done badly. 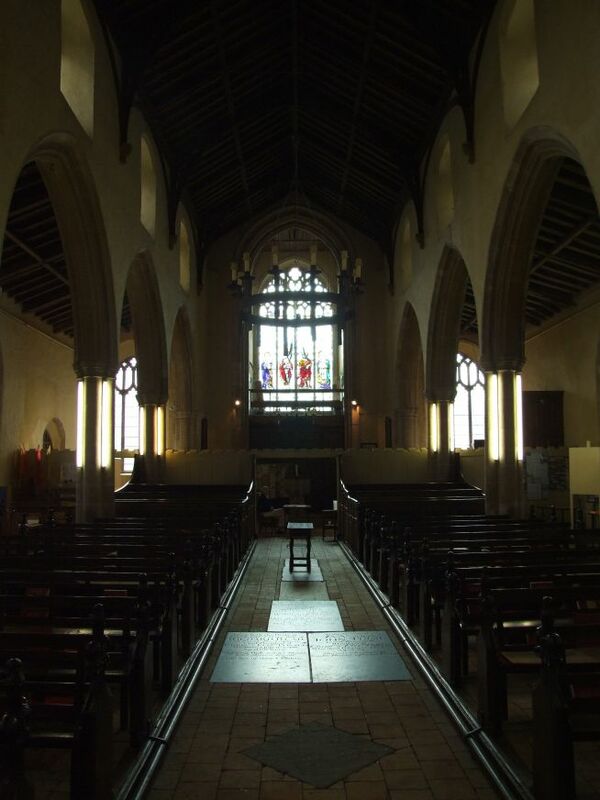 In any case, they are a little lost in this vast mouth, a huge chancel arch which seems to disappear into the fluted arcades as if they were all part of an elegant forest, perpendicular architecture of the highest quality.